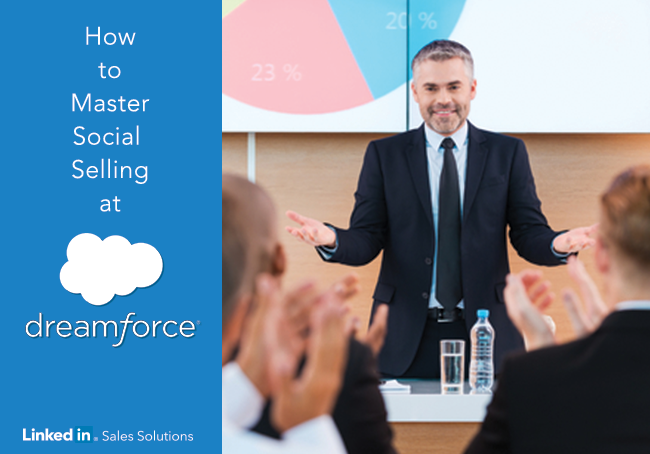 Learn what to do during and after Dreamforce to greatly improve your social selling skills. Are you looking to up your social selling game at Dreamforce this year? We’ve got you covered. Does your tagline accurately represent how you help buyers in your industry? Are there specific people you’d like to meet at Dreamforce? Don’t hope to meet them, make it happen. Before attending, make a list of the people you’d most like to meet. Check out their LinkedIn profile and use the “How You’re Connected” tool to see if there are any connections in your network who can introduce you via the “Get Introduced” feature. If you have access to TeamLink, you’ll automatically see if this person is connected with anyone in your organization. Perform research on the front end to improve your chances of having engaging discussions with the people you aim to meet. What can your shared connections tell you about the people you’d like to meet? Have the people you’d like to meet recently published content or a status update that merits discussion? Have they, or has their company, been featured in the news recently? Meeting these people and connecting on social channels is just the start. On the way home, develop a plan for continuing to provide value to your new contacts. Also, if your new contacts are from key accounts, think about how you can leverage your new relationships to form additional connections that will deepen your relationship with the entire buying committee. Don’t let your new relationships fizzle out. Momentum is your friend, so build on your new relationships to make them stronger. To get the most out of your Dreamforce attendance, make it a point to seek out the actionable nuggets you can easily add to your social selling strategy. And of course, have fun. Can’t make it to Dreamforce this year? Don’t let that stop you from improving your social selling skills. Download our eBook, The Guide to Social Selling Success.